Do you ever look at a pretty picture like this and then look around at all the clutter in your home that’s begging to be organized and feel like you want to just give it all away and start over? I feel like this is me, on the daily. As I see all the things I’ve accumulated around my house I am reminded that I already have so much I don’t need. I already have so much that I wanted! My life is so full of stuff that I have to buy more stuff to organize all my stuff! I have found a better way to design my space and organize my home that has kept me both from emptying my house of all its contents and spending a massive amount of money at the Container Store. It’s the power of contentment. For me that has meant learning to want what I have rather than have what I want. I’m using this as a guiding principle to designing a home that I want. 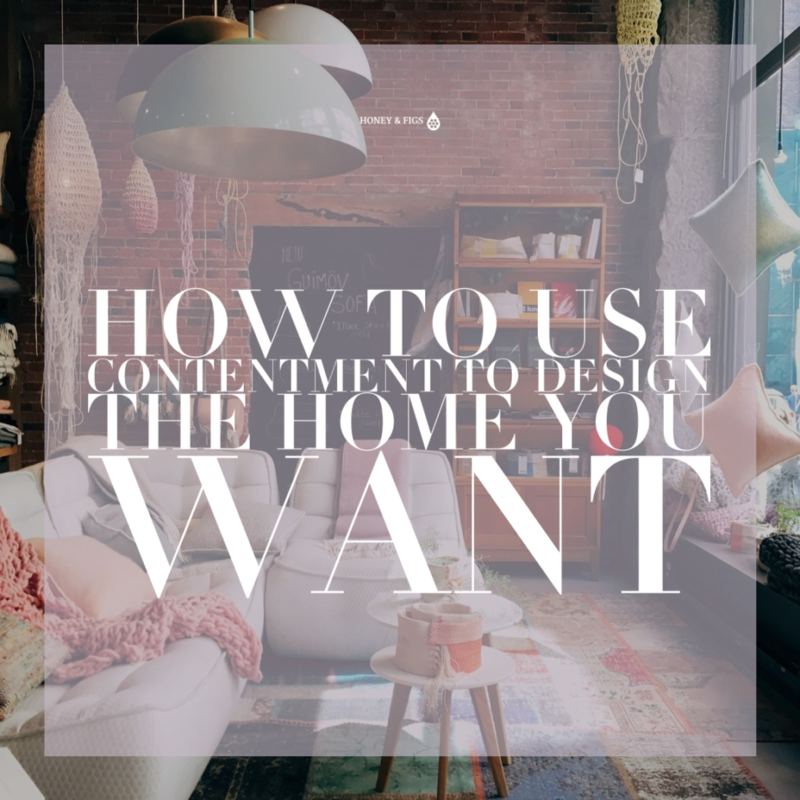 These are the 5 ways I’m using contentment to help me design the home I want. Parenting always offers us the greatest life illustrations. The week before last, our son, Luke, received his report card. We have taught him to treat his school work like a job so when he gets his report card, he gets paid for his work (any As and Bs). We’ve also taught him to follow simple budgeting principles of give 10%, save 20%, and spend the rest but whatever he puts in his savings bank he ends up spending the following week, which has resulted in a give, spend, spend budgeting practice. To combat this, we’re trying to teach him to be content with what he has and to be wise with what he spends his money on. Lesson #1: Delayed gratification. When he got his payday, he immediately wanted to spend all of it on an Xbox video game. I tried to encourage him to wait. Our first rule is “sleep on it” so he agreed to sleep on it and if he still wanted it the next day he would make his decision then. The next morning, he was ready to buy it and I encouraged him to wait until Black Friday to see if the game would go on sale or if he might change his mind and decide that he wanted to have some spending money on Thanksgiving Break. I just offered the advice but told him he had to make the decision. He thought about it and went back and forth. He was wrestling with the obsession of having the thing he wanted, that thrill of instant gratification we all crave. But he didn’t give in. Surprisingly at the end of the day he said “mom, did you notice I didn’t buy the game?” I was shocked. I asked what happened. He said, “I thought about it and what if I want to go to Disneyland on break or something else and I could have money to contribute to going if I didn’t spend it, so I decided to wait until Black Friday”. Sunday rolled around and he discovered that Black Friday week had already started on Xbox and the very game he wanted to buy 4 days earlier was now on sale for half the price. “Mom, I’m so glad I waited to buy the game” he said. This is when you want to do the happy dance as a mom. I was so proud of him for making the wise choice but I was even more inspired by him. Our children can teach us more lessons on how to be our best selves than anyone else sometimes. Delaying gratification can result in having more for less. Often when I’m faced with instant gratification, I try to trick myself by thinking I can just shift budget from somewhere else later to cover my desire to spend in that moment. But that does not create contentment or lasting peace. The more we have the more we seem to want, right? I’m learning to delay gratification and enjoy the anticipation like my son. Wanting what you have starts with evaluating what you have. This is a great exercise to do right before the holidays because not only will it serve to help declutter your home making it much easier to decorate. Start with the one room that’s causing you the most clutter grief right now (for me it’s my living room). Take an inventory of the things in that room. Books, furniture, picture frames, rugs, coffee tables, etc. and next to each item, write down where you bought it from. Then try to remember the day you purchased it. How did you feel when you bought it? What made you want to purchase that item? If you can’t remember, it may be a sign that you bought it on impulse and didn’t really want it or need it. Second, ask yourself Is it functional or does it need to be replaced? We have this oversized footstool that doubles as extra seating but it’s ripped and scuffed. It really does need to be replaced but not right this second, as it is serving a purpose and replacing it would create another problem. We also have a plethora of picture frames on our mantle that display my lovely family but they are in varying sizes and colors and for the life of me, I can’t remember purchasing most of them. Third, ask yourself do you love the item? If you don’t love the item, why you don’t love it? Asking myself these questions helped me discover that I love everything in my living room except for these two things. I do not love the footstool. I bought it because it matched the other furniture at the time and we were needing a same day solution, but for now, I’m using it to prop my tired feet on and being grateful for it. I also don’t love the picture frames because they don’t go with the decor and I feel like having them all there makes the mantle look cluttered, but I love looking at the faces of my family. Taking inventory of what you have in this manner will help you rekindle an appreciation for those things you purchased that you love and determine which things you no longer need so you can free up the clutter to enjoy your space even more. 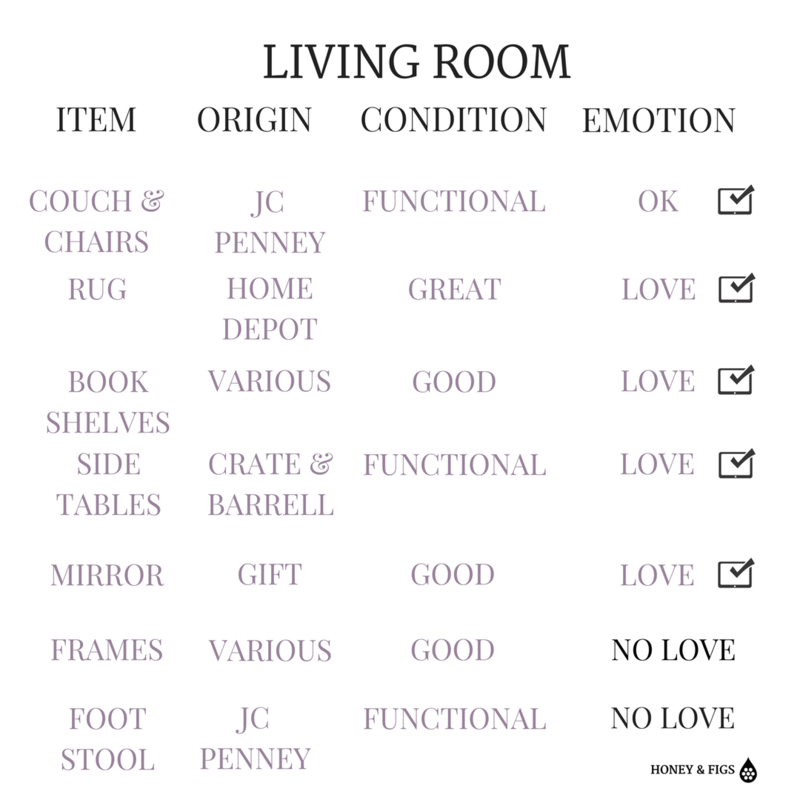 Now that you know what you don’t love, the question is can you donate the items right away or do you need to design a solution first to take their place? Let’s take your couch for example. Years ago, we updated our living room furniture and made the mistake of selling our couch before we had designed any idea for a new one. This created undue stress and we ended up purchasing a new living room set out of sheer necessity and way overpaying as a result. Don’t make the same mistake we did. If the things you don’t love are functional and do not have an immediate replacement then create a pathway to replacing them prior to getting rid of them. In my case, I would like to donate my picture frames and footstool but I don’t quite have any design ideas in mind to replace them yet, so for now they’ll stay put as I get my ideas together. In the meantime, I am content with the functionality these bring to my space. As you begin to look for inspiration in designing your space using only the things that you love, it’s helpful to look at design magazines, Pinterest posts of beautiful rooms and Instagram photos of lovely homes for inspiration. However, the more we look at things we don’t have, envy and jealousy can quickly set in and comparing ourselves to what others have can rob us of contentment. My solution for this is to consume these platforms with purpose rather than mindlessly peruse them just to pass the time. As an example, our flooring, which came with the house when we bought it 11 years ago needs to be replaced. The tiles are chipped in many places and they’re white with original white grout, which is now dark grey grout because it’s impossible to get clean. Recently, I wanted some inspiration for what types of floors would go well with my home so I took out all of my design books, magazines and did a few searches on flooring to gather some ideas. These resources served me well as a guide for what to look for and I was able to use that to check out a floor sample at the lumberyard. I now have a general idea of what flooring I want and what it will cost so I can start saving for this repair. We can find contentment by avoiding the trap of comparing our homes to others and coveting what we don’t have simply by using these platforms selectively for what they are designed to do which is to connect us with others, inspire us and encourage us, but not to consume our minds. There’s nothing wrong with wanting to beautify your home. We are wired to appreciate beauty and long to create beautiful spaces for ourselves. The next step to using contentment to design the home you want is counting the cost and making a plan. Going with the couch example, If the couch you love is $1,000 and you think you can get $200 for your used couch, you know you need to save up $800 before you can sell your current one. You have your design, you know the cost, now you just need a plan to get there. Begin a separate savings account for the couch. Figure out how long it will take you to save the $800, then auto direct savings to that account each month or each week until you meet your goal. For instance, $800 breaks down to only $15 per week you’d need to save over 52 weeks. By next Christmas, your gift to yourself could be a new living room sofa! Cutting your Starbucks visits by 3 days a week could easily get you to that $15. Or bringing your lunch to work just one day per week instead of eating out could get you there. If you can’t cut anything in your budget, then look for ways you could make more money. Maybe you have a skill you could charge for, teach Spanish lessons, bake specialty cakes, tutor students in math, sell your homemade crafts on Etsy, offer in-home organizing sessions. If you made an extra $267 per month you could have that couch in just 90 days! As you count the cost and make a plan for the design you want you’ll get there before you know it and you will have the thrill of anticipation for the day you can bring your full design to life. Lastly, take one more look at your room of choice and ask yourself what would make this space more fulfilling? As you do so, allow yourself to concentrate on the great things that happen in that room. For me, it’s our family nights, entertaining the neighborhood kids with Xbox, and connecting with each other daily. I realized that the true benefits of my living room are not improved one bit by the updating of the furniture or the replacement of the picture frames. But the meaning of this room is perfect just as it is. I am happy living in this room. I am grateful for it. I am content. I look around and think I do need to repair the floors and I really need to patch that hole in the wall in my master bathroom from when the plumber came last year. But I’m relishing the time I have to thoughtfully design those spaces. I’m Imaging what they will be. Then counting the cost of what it will take and making a plan to get there. I will improve these spaces eventually, but for now I am thankful that I have floors that protect my feet from critters. I have a bathroom with plumbing that works. I have a kitchen that provides me with the ability to make food for my family. And most of all, I have a home filled with love and wonderful humans to share it with. I have ALL I need. I am living on less, a LOT less these days than I used to and you know what I’m finding? I don’t miss a thing. I am so content in having less. I am happier now than when I had more, not because it isn’t a sacrifice to make things work but because I am forced to make better choices and as a result I am reaping the benefits of an abundant life. May you discover that the home you want is the home you have. Thank you for making this idea of designing with contentment in mind practical. Often, I desire to do this but don’t even know where to begin. So glad you found it helpful Christina! Great post! I’ve been “needing” to replace our sofa for over a year. Now I can tell myself it’s functional and be happy with it until we can save the money for a new one. Thanks for the fresh perspective. Hi Theo. Yay! I’m so glad you thought it was helpful. Your comments mean so much to me. Thank you!